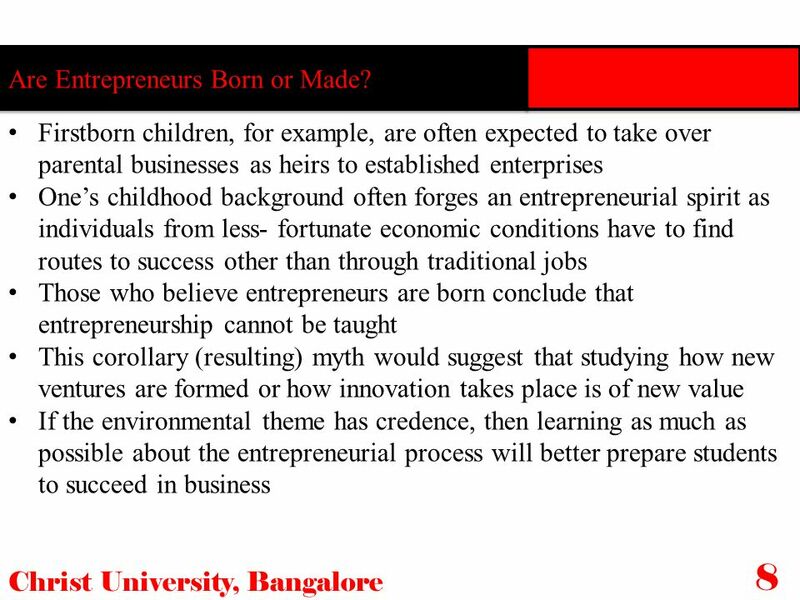 13 Are Entrepreneurs Born or Made? 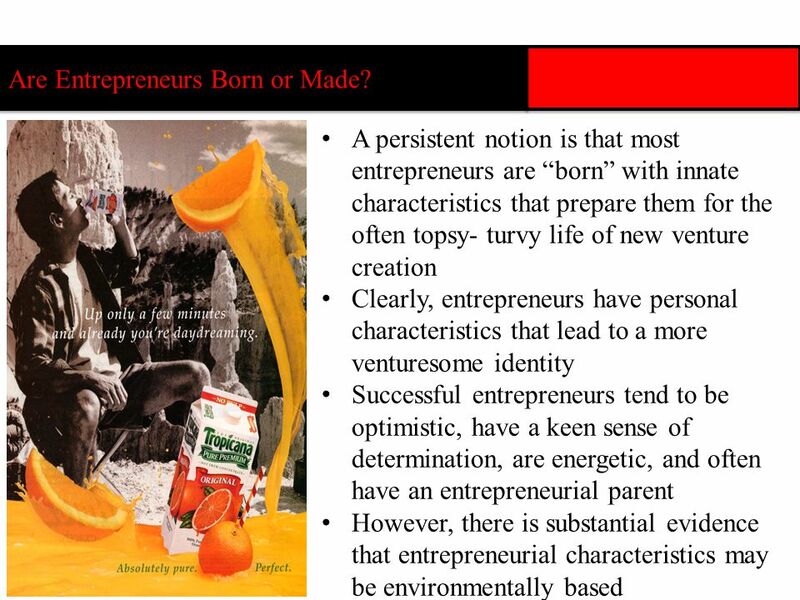 14 8 Are Entrepreneurs Born or Made? b. Make or Break on the First Venture: Another popular myth is that entrepreneurs strike it rich with the first great “flash of genius,” or, conversely, they fail miserably with the first venture. 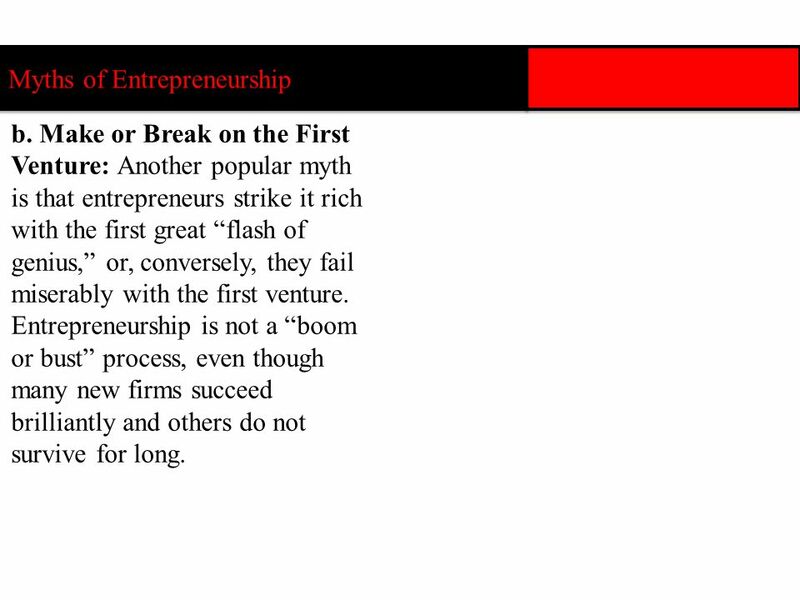 Entrepreneurship is not a “boom or bust” process, even though many new firms succeed brilliantly and others do not survive for long. 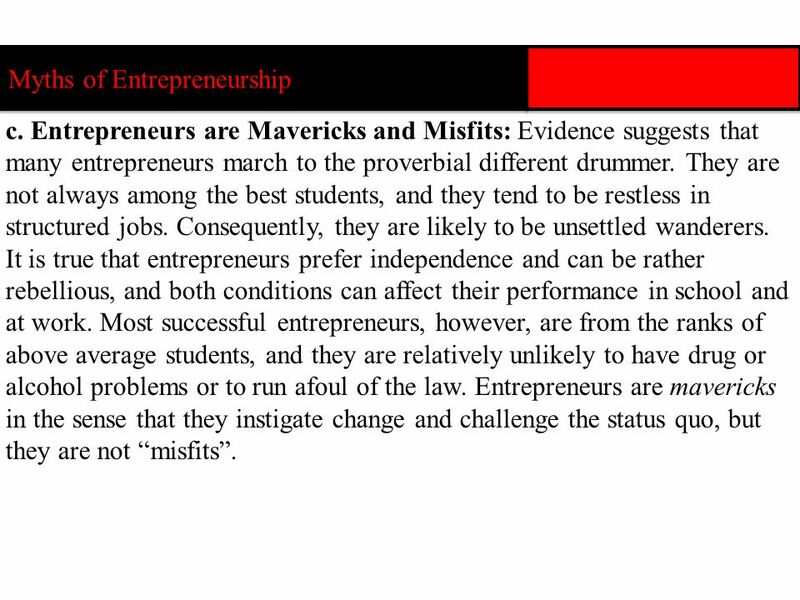 c. Entrepreneurs are Mavericks and Misfits: Evidence suggests that many entrepreneurs march to the proverbial different drummer. They are not always among the best students, and they tend to be restless in structured jobs. Consequently, they are likely to be unsettled wanderers. It is true that entrepreneurs prefer independence and can be rather rebellious, and both conditions can affect their performance in school and at work. 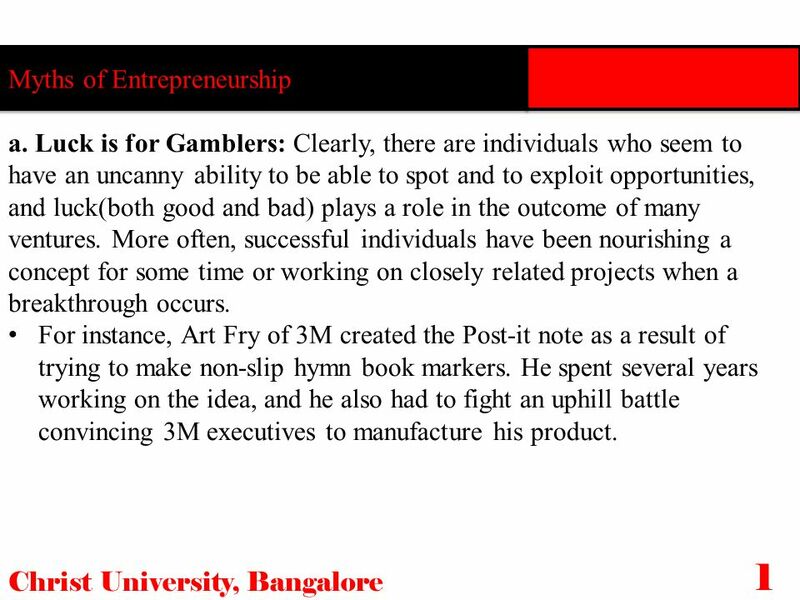 Most successful entrepreneurs, however, are from the ranks of above average students, and they are relatively unlikely to have drug or alcohol problems or to run afoul of the law. Entrepreneurs are mavericks in the sense that they instigate change and challenge the status quo, but they are not “misfits”. 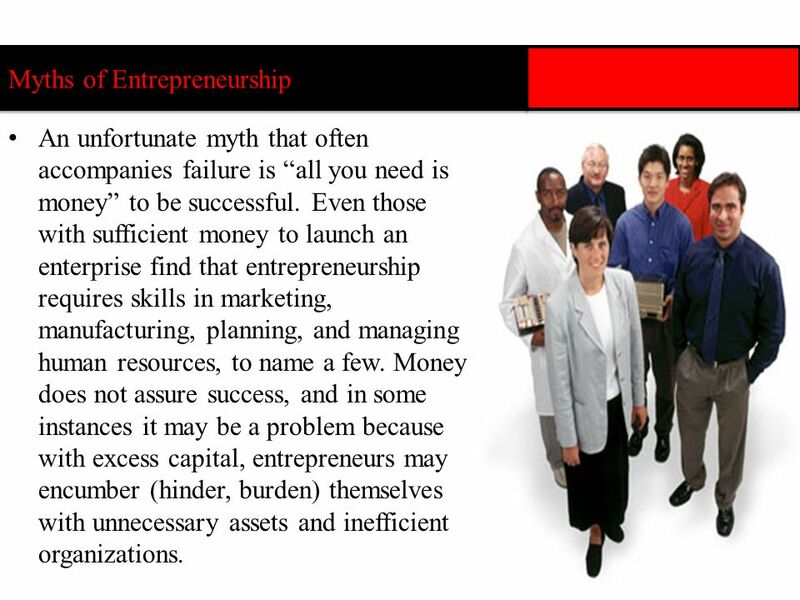 An unfortunate myth that often accompanies failure is “all you need is money” to be successful. 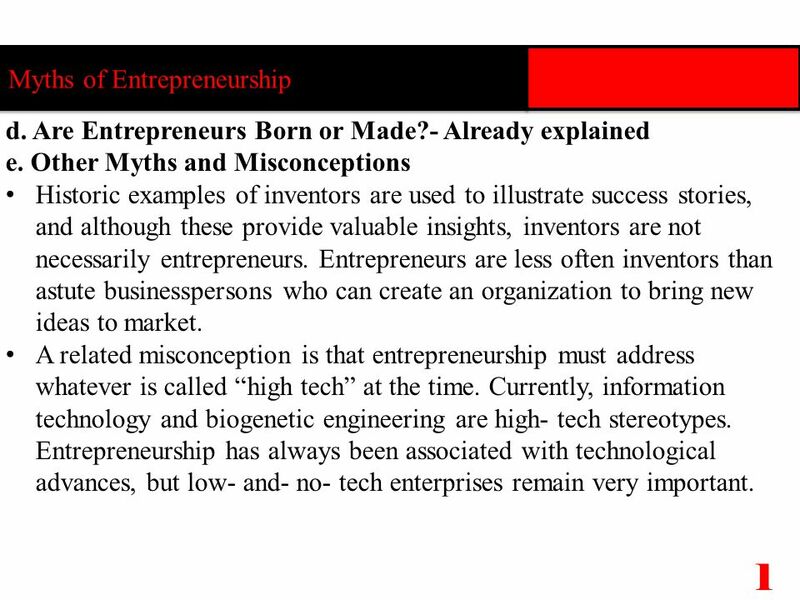 Even those with sufficient money to launch an enterprise find that entrepreneurship requires skills in marketing, manufacturing, planning, and managing human resources, to name a few. Money does not assure success, and in some instances it may be a problem because with excess capital, entrepreneurs may encumber (hinder, burden) themselves with unnecessary assets and inefficient organizations. 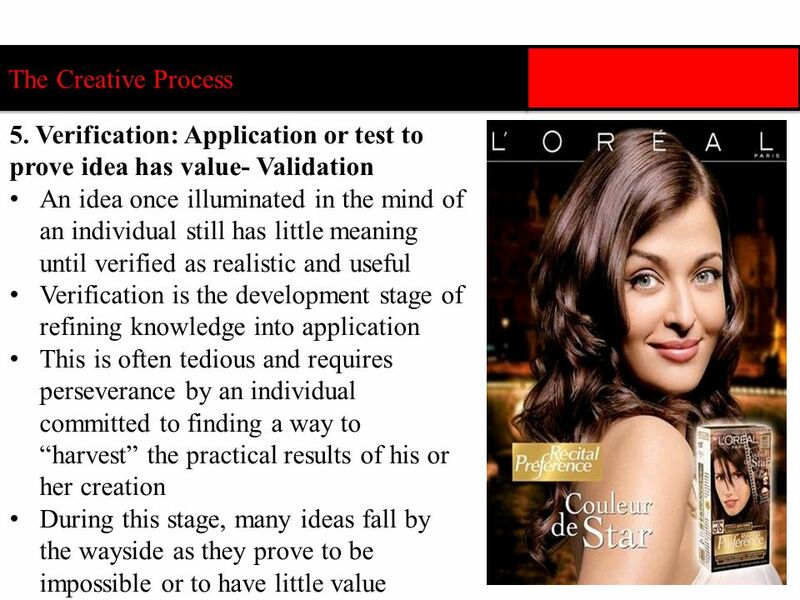 Idea Generation Stage: is the conscious identification of a product idea that logically addresses an opportunity. 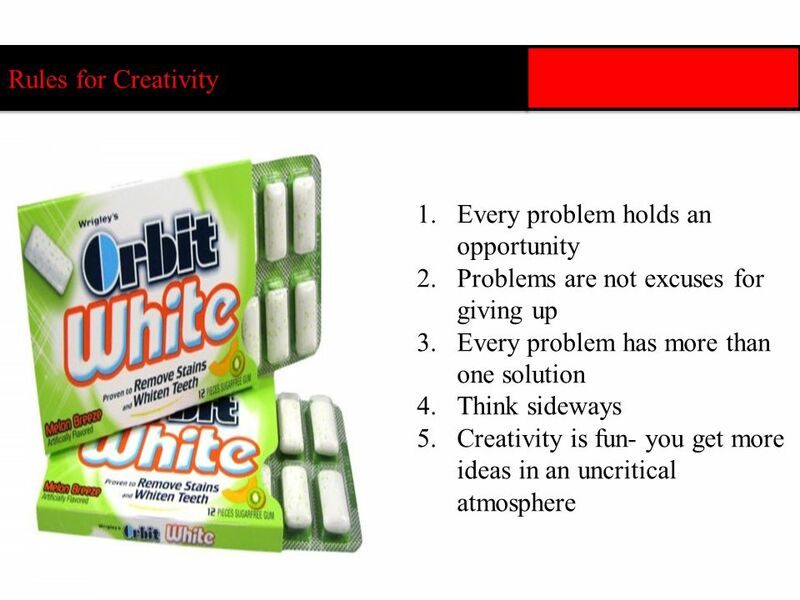 Giving an Idea Form: Once an idea has begun to gel, the entrepreneur must set it down on paper, design it, and if appropriate, make a “bench- model”. Transition to the Next Stage: If the proposal is made through corporate R & D, it must be accepted and funded. 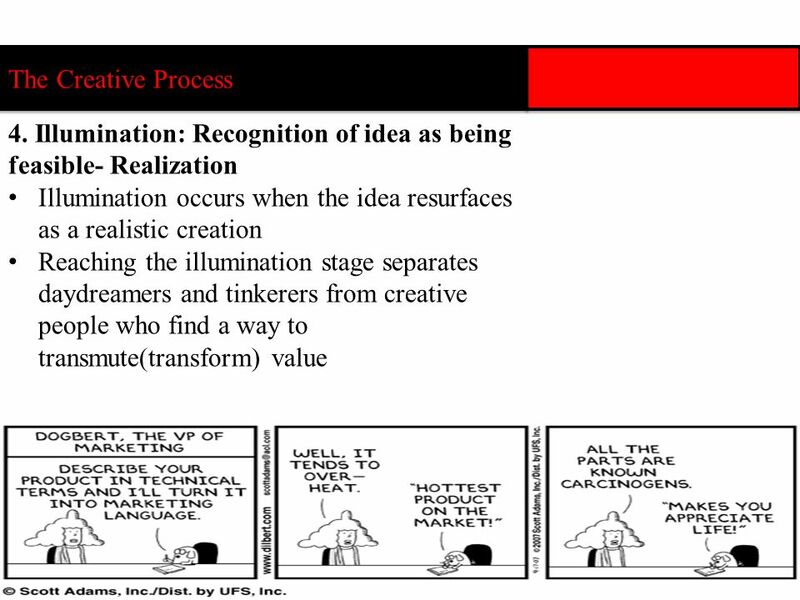 If management cannot share the same vision of success as the innovator, the product may be terminated without fanfare. Screening the Product: Screening procedures exist in larger organizations whereby a product is submitted to a formal survey among key managers and engineers. The screening process is a subjective evaluation that relies on expert opinion of a select group to rate the proposal for its commercial feasibility. 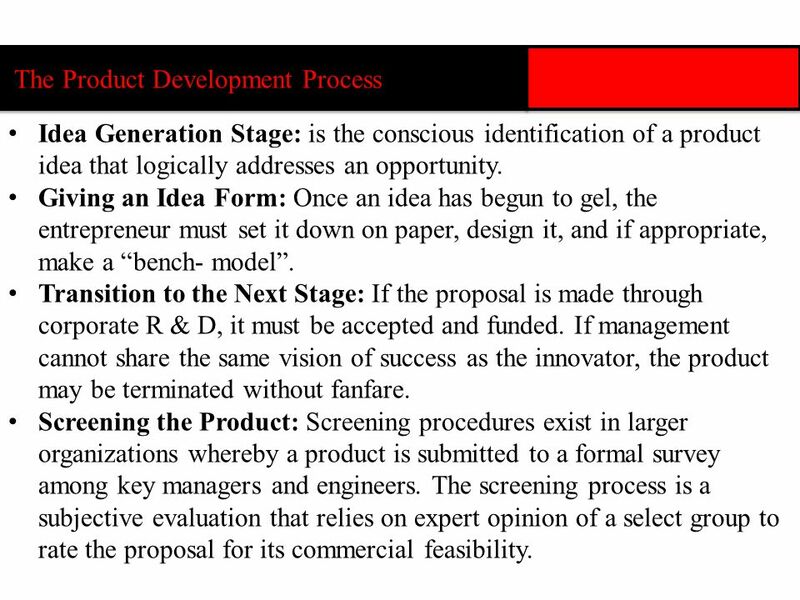 The Incubation Stage: Having survived a screening process and obtained funding, the innovator must set about implementing the first stage of actual product development. 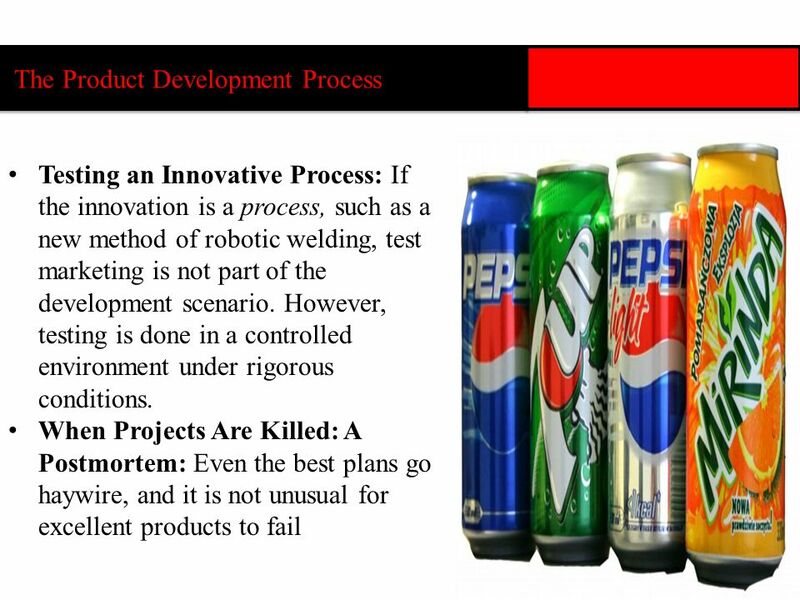 The product must be devised and a prototype developed. Product Design: Traditional R&D will follow a prescribed path of turning rough sketches into blueprints. These will be expanded into material lists and a plan for making one item- a prototype. 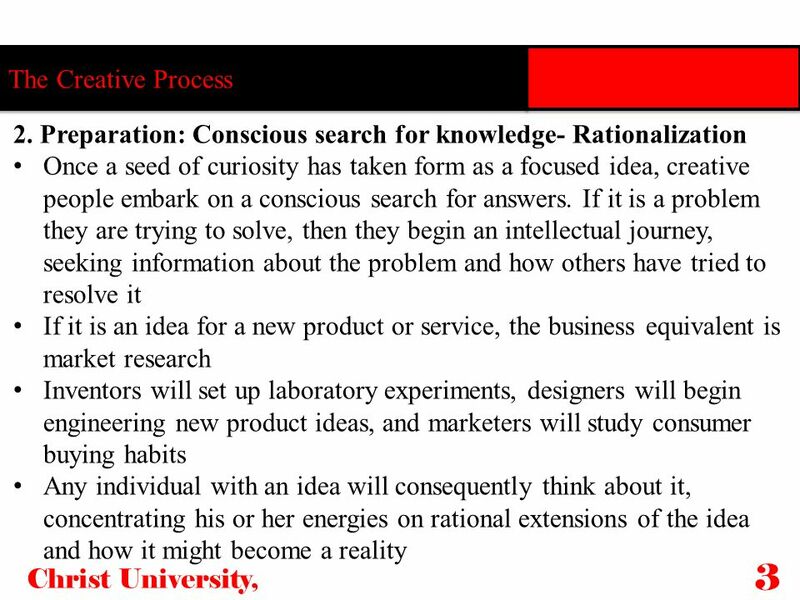 Making the Prototype: Assuming the innovator has endured the failures and has a design that finally seems workable, a prototype is built and submitted to testing. 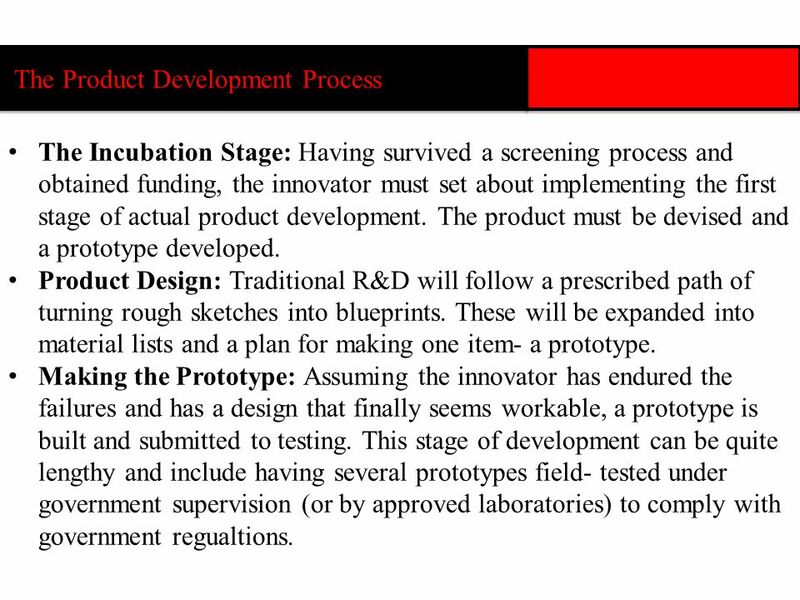 This stage of development can be quite lengthy and include having several prototypes field- tested under government supervision (or by approved laboratories) to comply with government regualtions. 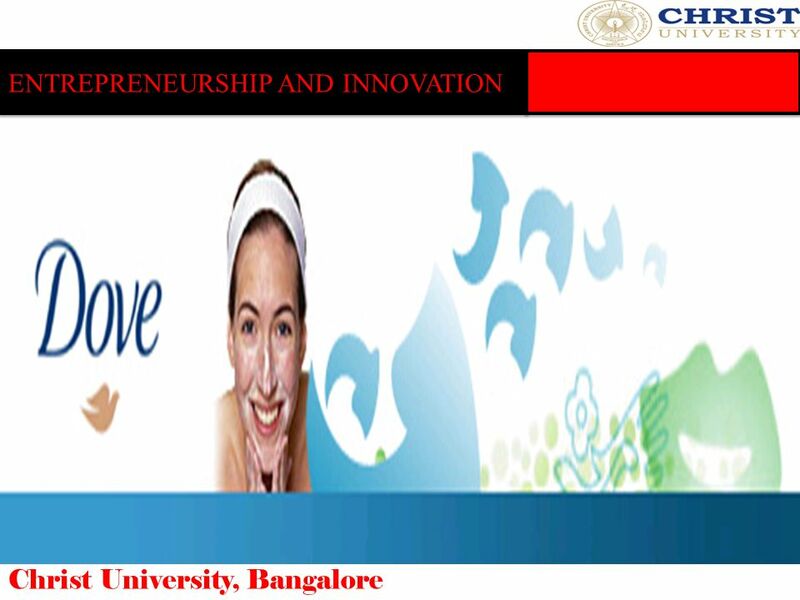 Commercialization Decision: The critical milestone activity at this point is to write a formal business plan. 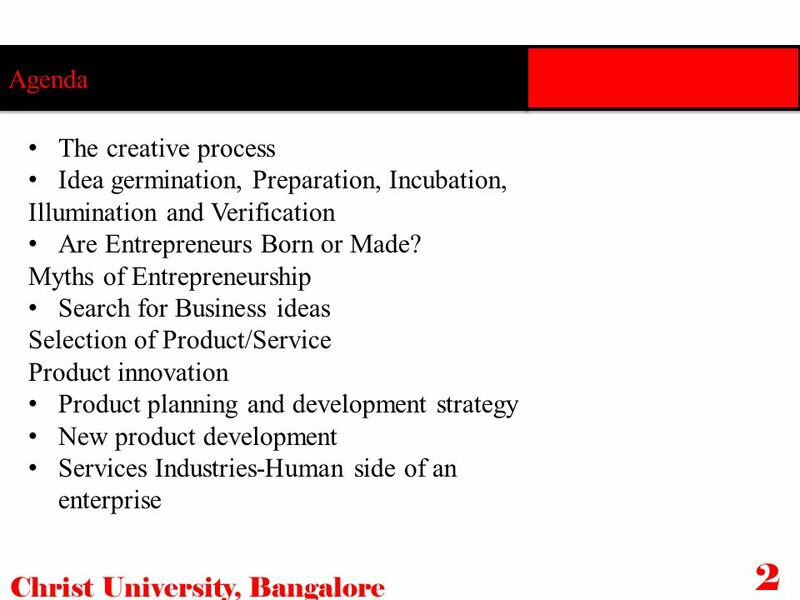 The entrepreneur may have written an initial business plan at the proposal stage, but the product has probably undergone substantial stages that will require a revised plan. 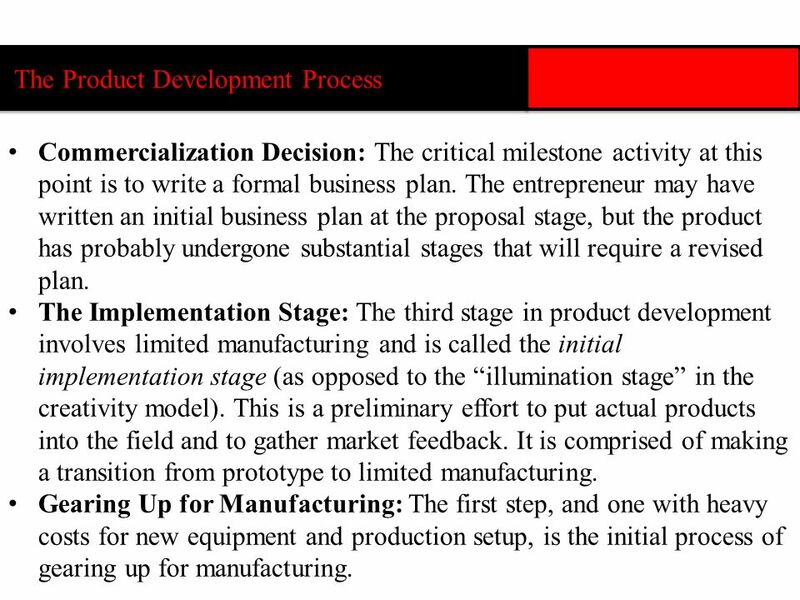 The Implementation Stage: The third stage in product development involves limited manufacturing and is called the initial implementation stage (as opposed to the “illumination stage” in the creativity model). 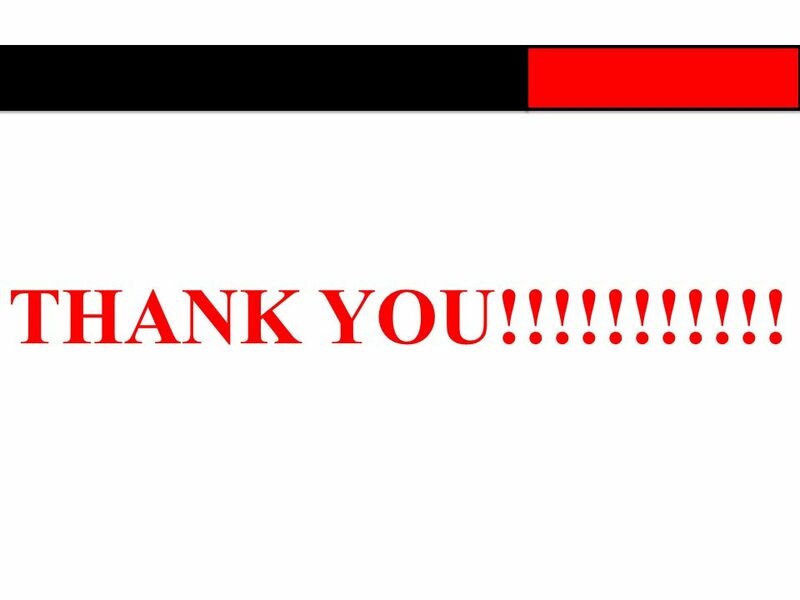 This is a preliminary effort to put actual products into the field and to gather market feedback. It is comprised of making a transition from prototype to limited manufacturing. Gearing Up for Manufacturing: The first step, and one with heavy costs for new equipment and production setup, is the initial process of gearing up for manufacturing. Limited Production for Testing: The first actual production run of a new product may require several dozen or thousands of items. Market Testing: Even a simple product will have to be tested with actual consumers. 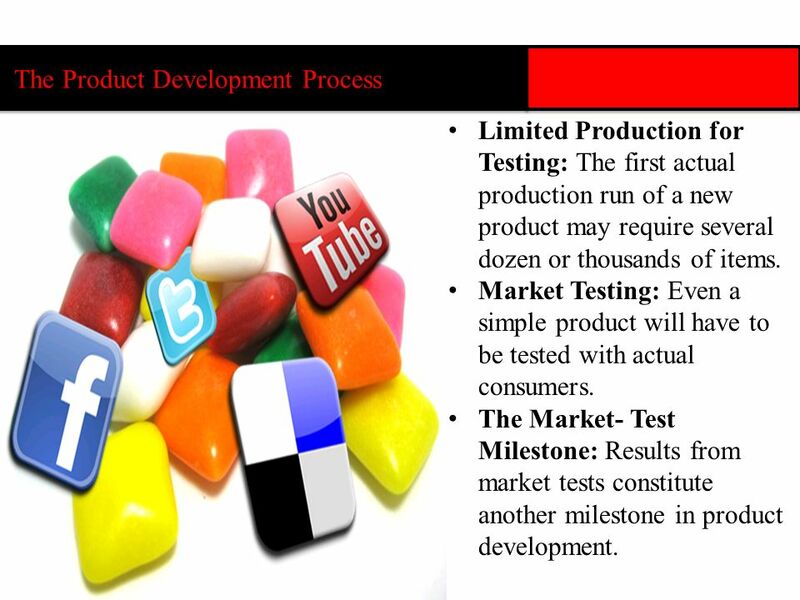 The Market- Test Milestone: Results from market tests constitute another milestone in product development. 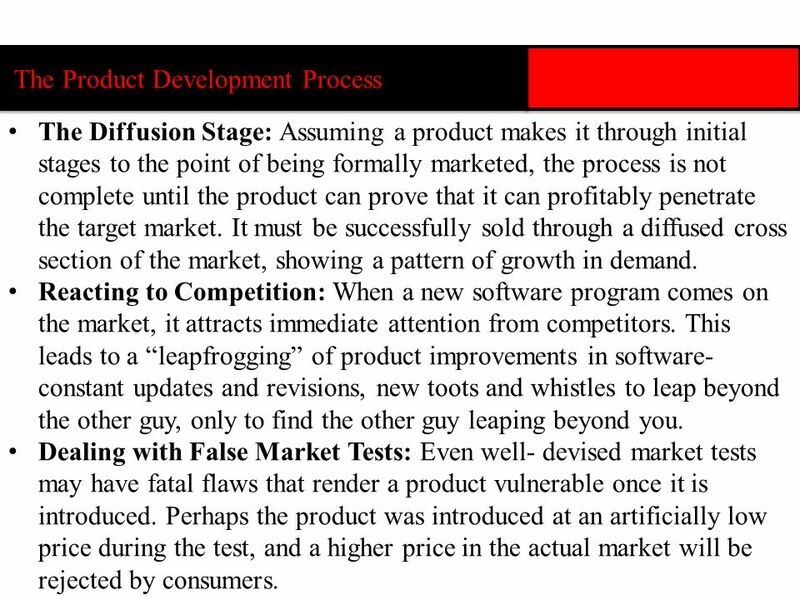 The Diffusion Stage: Assuming a product makes it through initial stages to the point of being formally marketed, the process is not complete until the product can prove that it can profitably penetrate the target market. 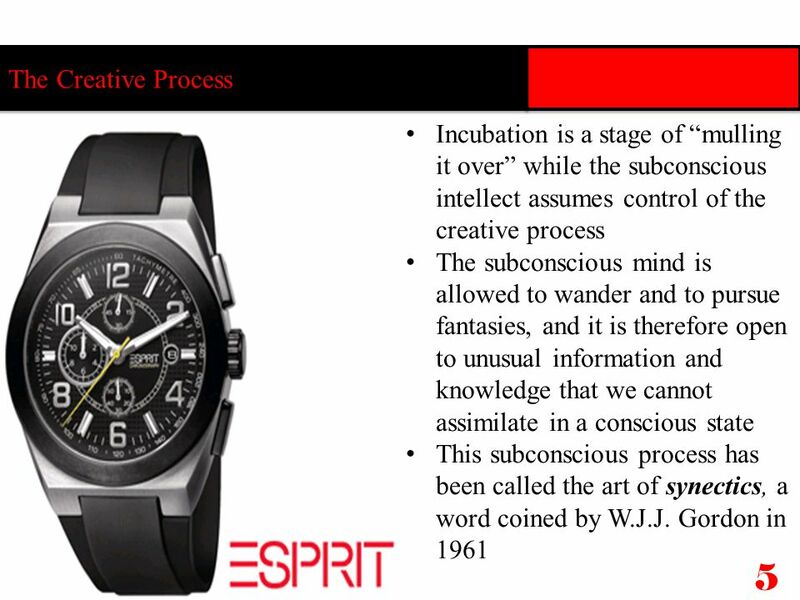 It must be successfully sold through a diffused cross section of the market, showing a pattern of growth in demand. Reacting to Competition: When a new software program comes on the market, it attracts immediate attention from competitors. This leads to a “leapfrogging” of product improvements in software- constant updates and revisions, new toots and whistles to leap beyond the other guy, only to find the other guy leaping beyond you. Dealing with False Market Tests: Even well- devised market tests may have fatal flaws that render a product vulnerable once it is introduced. Perhaps the product was introduced at an artificially low price during the test, and a higher price in the actual market will be rejected by consumers. Recognizing Management Assumptions: Every new product carries with it a set of assumptions made by management. These include profit forecasts made during development stages, economic forecasts that underpin market demand, scenarios of competition, cost estimates for factors of production, and many more. When one of these assumptions changes, the product may quickly come under scrutiny. For example, a slight change in material costs could render the product a loser, and such a change affected toy manufacturers in dramatic fashion during the 1970s when oil prices soared. Toys made of plastics required petroleum- based resins, and when oil prices tripled, plastic toys became expensive and unprofitable. When something like this happens, management should have contingency plans. 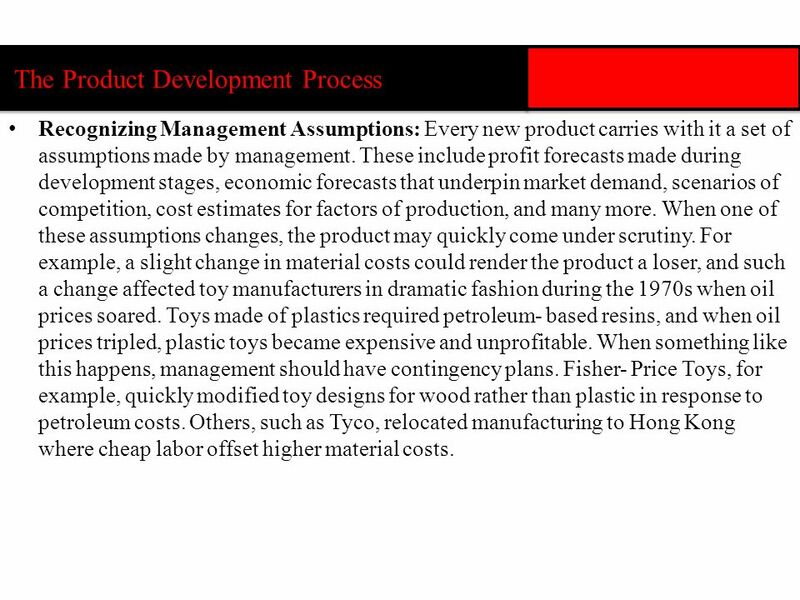 Fisher- Price Toys, for example, quickly modified toy designs for wood rather than plastic in response to petroleum costs. Others, such as Tyco, relocated manufacturing to Hong Kong where cheap labor offset higher material costs. 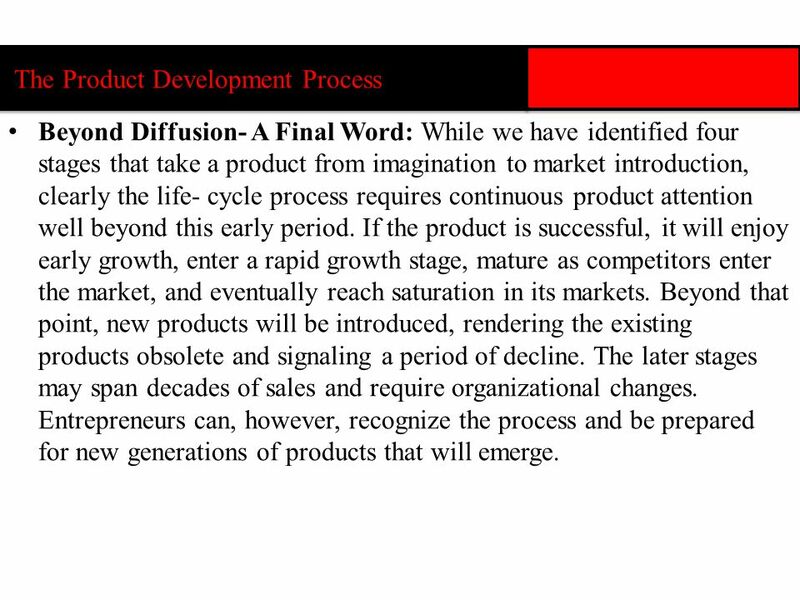 Beyond Diffusion- A Final Word: While we have identified four stages that take a product from imagination to market introduction, clearly the life- cycle process requires continuous product attention well beyond this early period. 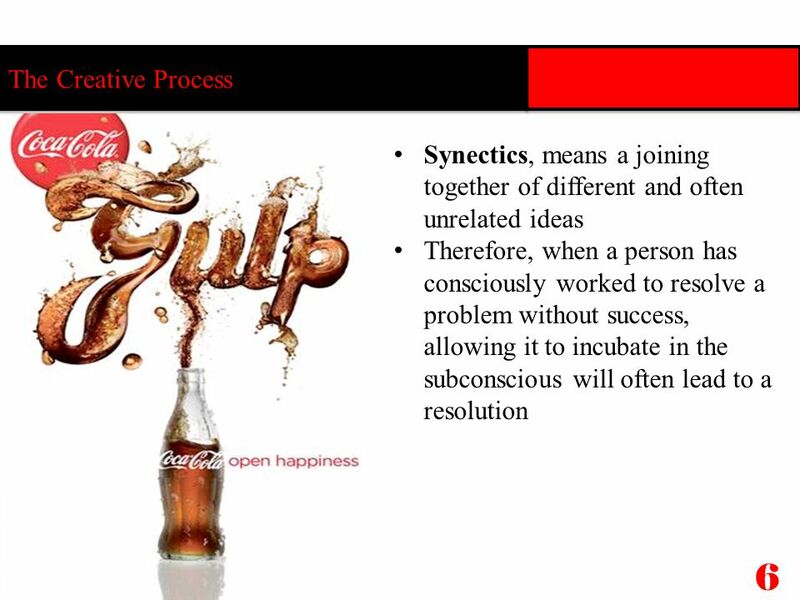 If the product is successful, it will enjoy early growth, enter a rapid growth stage, mature as competitors enter the market, and eventually reach saturation in its markets. Beyond that point, new products will be introduced, rendering the existing products obsolete and signaling a period of decline. The later stages may span decades of sales and require organizational changes. 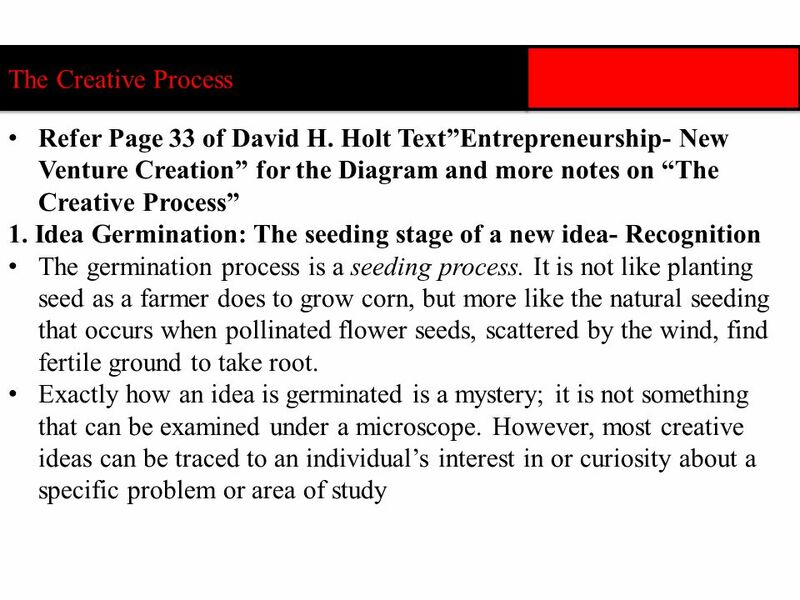 Entrepreneurs can, however, recognize the process and be prepared for new generations of products that will emerge. 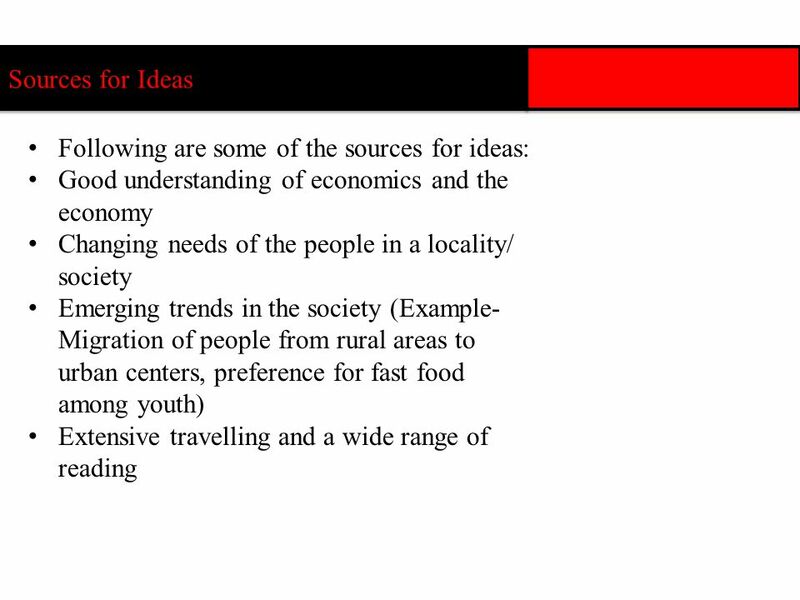 Download ppt "ENTREPRENEURSHIP AND INNOVATION"
© PMB 2007 Learning for Life and Work Unit 2: Statutory Minimum Requirements. The Main Idea To ensure success, entrepreneurs need to understand the industry and the market. 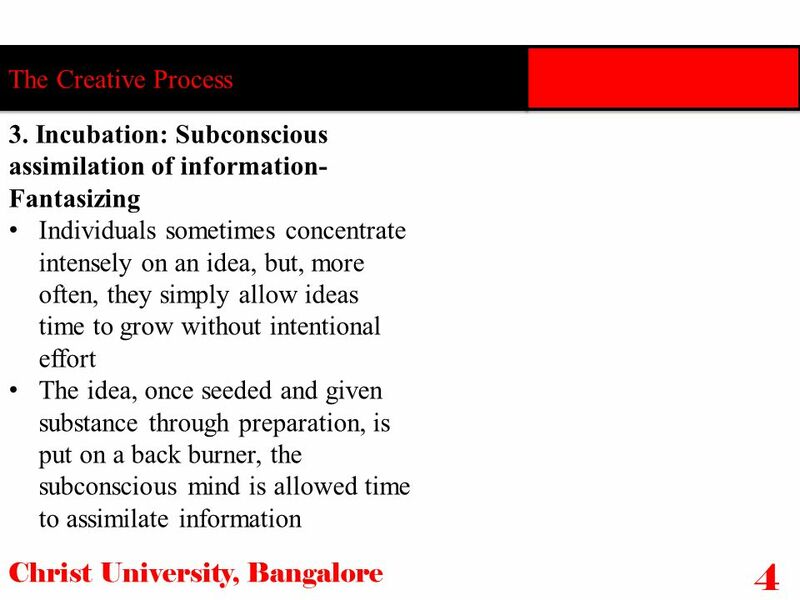 They should define areas of analysis and conduct effective. Planning for Change and Uncertainty ISMT 200G -- March 20, 2007 Dr. Theodore H. K. Clark Associate Professor and Academic Director of MSc in IS Management. 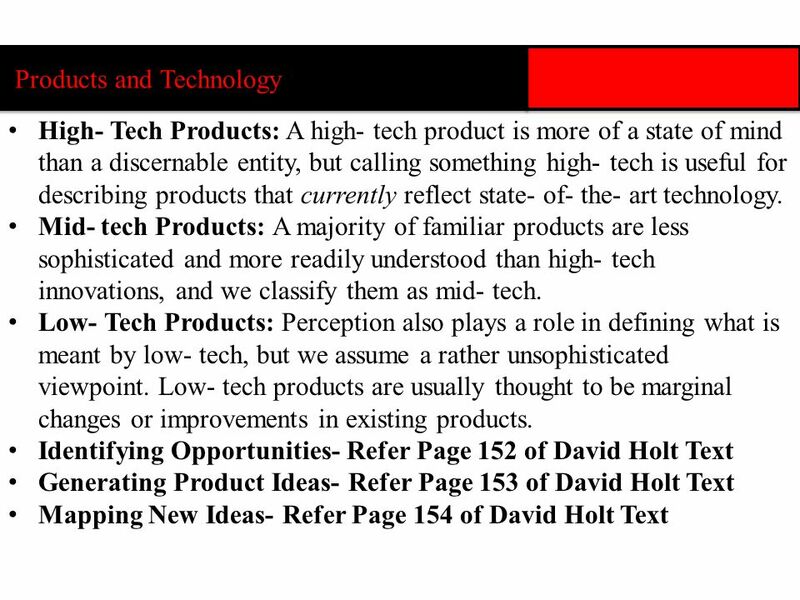 Copyright Atomic Dog Publishing, 2007 Chapter 13: “Conceiving, Developing, and Managing Products” Joel R. Evans & Barry Berman Marketing, 10e: Marketing. 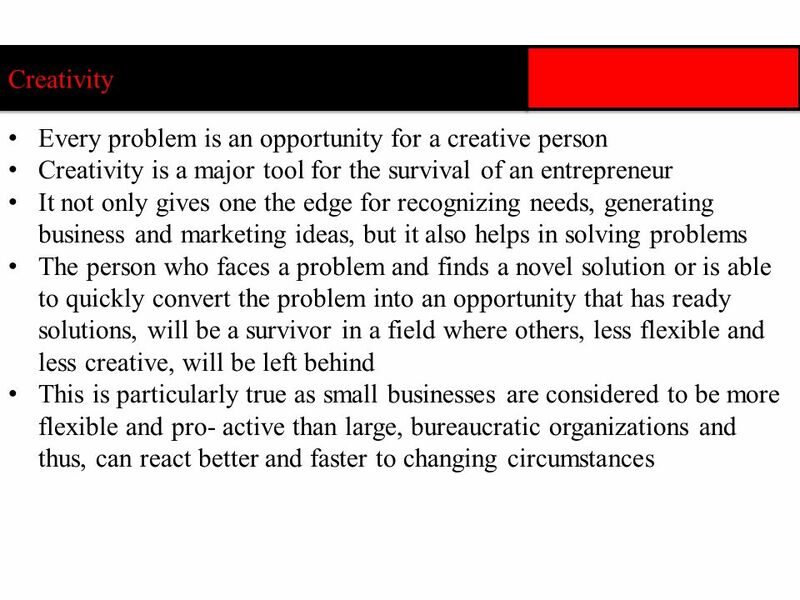 Management, 7e Schermerhorn Prepared by Michael K. McCuddy Valparaiso University John Wiley & Sons, Inc.
Learning outcomes Explain nature of innovation Critical role of entrepreneurs in the process of innovation Link between innovation, opportunity and entrepreneurship. 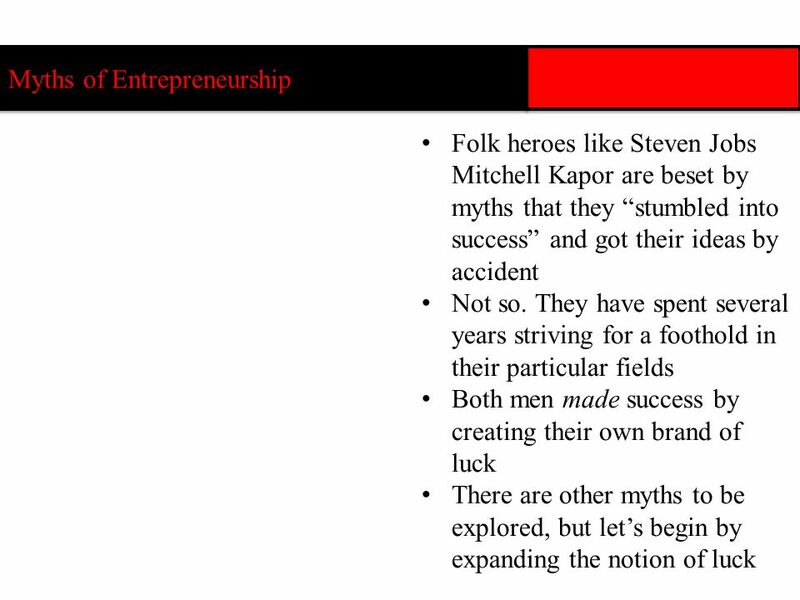 The Foundations of Entrepreneurship Chapter1: Entrepreneurship 1.